and rejection and pain and misery and loss." This one is really just for April. 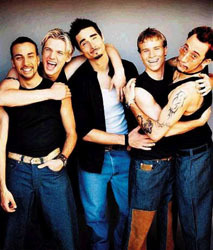 As you can probably see, I don't find BSB very attractive, hence the fact I can only find five decent pictures. Well, I tried. The others look quite happy, but Brian just looks scared. However, he does have the fact that he's being manhandled by AJ to deal with, so maybe there's an excuse. Then they just look scary in this. With the metallic background, the near-scowls and the mafia-like black suits, they look almost threatening. But they're a boyband, so, not really. Heh. Brian getting his just dues for not looking good in photos? Quite amusing, boys being boys. They finally get it right as a group. 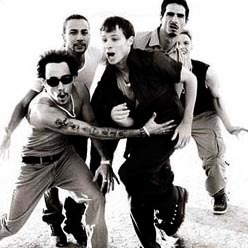 I give *NSYNC the same treatment over here.